NEW DELHI: The finance ministry strongly defended state-run banks after the Reserve Bank of India (RBI) raised concerns about their rising bad loans, management and business practices, and, in turn, hit out at private and foreign banks saying their business models were not conducive to economic growth. 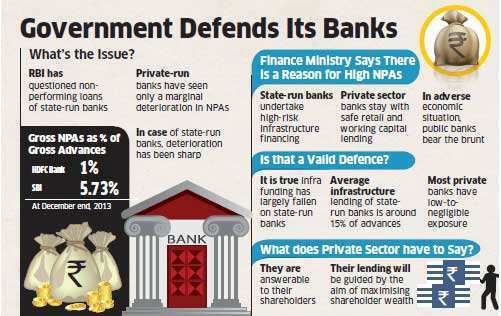 The ministry told RBI it was unfair to compare private banks with state-run ones as the latter are forced to take on greater exposure to the infrastructure sector and government-sponsored schemes, resulting in higher bad loans, a finance ministry official told ET. In a recent paper to the government, the central bank had observed that the impaired assets ratio is high for state-owned lenders compared with rivals and that they have resorted more to restructuring rather than recovery of non-performing assets (NPAs). The central bank hasn’t taken into account the pressures facing state-run banks, according to the finance ministry. “RBI has conveniently ignored the pattern of infrastructure financing and the operating environment in which state-run banks function,” said the ministry official, pointing out that the private sector has totally ignored high-risk infrastructure funding that the country desperately needs. “The financing approach of private banks is that they give more emphasis to retail loans and short-term working capital credit. Thus, the burden falls on PSBs (public sector banks) to take higher exposure in infrastructure, manufacturing sector and term loan financing,” the official said. The ministry has argued that if state-owned banks also adopt the same financing approach, it may have deleterious consequences for economic growth. “State-run banks are trying to support credit growth for productive sectors and facilitate sustenance of economic growth,” said the official, adding that the major stress sectors are iron, steel, textile and aviation. A recent Morgan Stanely note supported this contention. The exposure to infrastructure for Indusind Bank is less than 2 per cent while that of Kotak Mahindra Bank and HDFC Bank is very low, it said. In contrast, the exposure of state-run banks is around 15 per cent of the total, exposing them more to sectors that have borne the brunt of the slowdown and policy paralysis. A senior private banker, however, dismissed the government’s contentions and said that nonstate lenders follow all RBI guidelines, which include mandatory lending to the priority sector. “At the end of the day we are responsible to our shareholders,” he added, justifying the prudent lending by private banks. A state-run bank’s chairman backed the finance ministry’s stand and said RBI should find out what percentage of governmentrun bank NPAs is due to external factors. “We have been hearing that private banks are more efficient but that is not the case. They are just playing safer and safer,” he said, adding that once the economy improves, the valuation of state-run banks will improve dramatically. Some bankers feel that this can-not be a justification for the mountain of bad loans at state-run banks. “PSBs may have legacy issues but we need to have more robust systems on credit appraisal and recovery so that the condition does not deteriorate further,” said MP Shorawala, an independent director at Central Bank of India. Gross non-performing assets of public sector banks rose to 5.17 per cent of their advances at the end of December 2013, against 4.18 per cent a year before. The highest NPAs, at 7.21 per cent of advances, are in loans to small and medium enterprises followed by agriculture, at 5.99 per cent. HDFC Bank had a gross non-performing loan ratio of about 1 per cent at the end of 2012-13. The finance ministry has, however, admitted that the NPAs of state-run banks are higher in government-sponsored schemes in which they are mandated to participate.